I was there with the Queen of England, Ben Franklin and about 200 other folks. The common interest? All of us were attending the Tourism Rally on June 10. We are very concerned about proposed cuts in funding for tourism in Pennsyvlania. The advertising budget may be slashed, and we are hoping to convince the legislature and Governor to preserve it and to support the 400,000 jobs in the state that rely on this industry. Tourism is the second largest industry in the state – and raised $28 billion in revenue for 2007. The money that our local Convention and Visitors Bureau gets from the state is used for advertising – and for supporting small businesses like ours in Lancaster County that rely on the CVB. 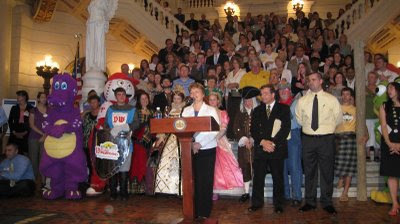 So, when I was asked to represent the bed and breakfast industry, I accepted and gave my speech in front of the steps of the grand rotunda in the Capitol Building in Harrisburg. Four other people spoke, all from different backgrounds and jobs, all representing the many different businesses that are affected by tourism. videotaped. The Capitol was dedicated in 1906, modeled after St. Peter’s Basilica in Rome. It is a strikingly beautiful building – although the acoustics are not conducive for taping. So we searched for what we thought would be a quiet corner near a side entrance, only to discover that our taping would be interrupted by half a dozen people hurrying past us to get to work. 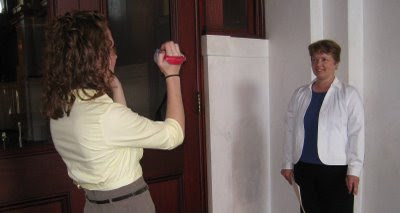 The press conference itself was interesting – legislators coming and going, most of the people not easily identifiable as press – and then the camera crews rushing in, testing the light settings, taping, running around to interview spokespeople. And, in light of what is occurring in Iran this week, we are reminded that our freedom is something that we should not take lightly. This government that we have created is like nothing else anywhere on the planet. The fact that we can rally, protest, write letters to the editor, call our representatives, vote…all of those freedoms did not come easily. Let us not take for granted what has been given to us. There are people halfway across the world who are risking their lives to do what I was able to do. What inspired me to write was the sight of Bruce lying prone on my oriental carpet in the sitting room – exhausted after having cut the lawn with a push mower (these are quite popular here in Lancaster County). This happens every time he mows. You see, this year he decided we could trim our budget by cutting our lawn at The Artist's Inn. So he cancelled the service that had cut, trimmed, carried away clippings and done a terrific job for the past ten years. Now we have Bruce with his green machine. Of course, we have a perfectly good mower – actually a self propelled one that used to be my father’s. But Bruce answered the call of “going green” last year when he was inspired by our neighbors, the Wengers. Bruce would watch as Bob effortlessly cut their lawn with the old-fashioned push mower. At times, their ten-year old son, Michael, also mowed. The mower seemed to glide over the grass like swans on a lake, didn’t make any noise, and would afford the “pusher” some exercise. All sounded like a good idea at the time. And so Bruce ordered the bright green mower. It came in a box and he put it together. The handle broke in the first three months. It never felt quite as easy to operate as Bob Wenger’s. Bruce came across an old push mower during his walk one day. A neighbor had put a “free” sign on it and placed it at the curb. This was a convenient find, as Bruce was waiting for the other mower’s replacement handle to arrive. Once the blades were sharpened, the mower seemed to do the job. Yes, it takes a little muscle, and my flowers are a bit worse for the wear…but we sure are green. And Bruce remains trim while he trims the grass. I just wonder how exhausted he’ll be when the dog days of August roll around….